I know lately my reviews have been few and far between with more and more postings of my ever growing and obsessive VHS collecting popping up on here more than anything, but with what's been going on in my personal life this past month and all the new changes that will be happening from here on out until things settle down in April, I'd rather post something rather than nothing at all. Plus, it gives me a chance to show off my prize possessions as my collection grows more and more every day. First off, I really need to thank my good buddy Ingo over at Hellford 667 Movie Reviews for helping me get my hands on these beauties. I really couldn't have done it without him. Besides being a fellow filmgeek and collector, he's also become a really good friend. Thanks man! Today we have a really rad German VHS release of Hardware (as it's known here in the states) aka M.A.R.K. 13 (as it's known Internationally with just as cool a sounding name) from writer/director Richard Stanely. I'd kill for an image of this on a poster print hanging on my wall! What's really great about a lot of the German VHS tapes is that they come in "book case" style VHS cases where rather than have a paper insert, the images are actually on the cases themselves. Not all of them come this way, but a good majority of them do and it's become my new obsession of collecting as many of these suckers as possible, which is really hard to do since a "lot" of sellers in Germany won't ship internationally. M.A.R.K. 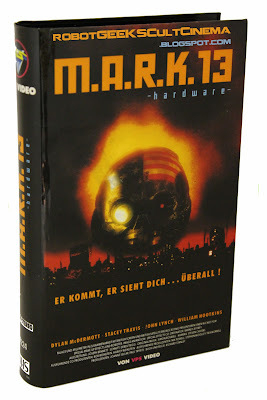 13, or Hardware as it is called here in the states, is one of my favorite low budget sci-fi flicks ever. While it has a few things stacked against it, like budget for one, it also has so much going for it that makes it stand far out from the crowd. If you take the time to revisit the uncut version of this, I guarantee you that you'll enjoy it a helluva lot more than when it was initially released. Director Richard Stanley, amazingly with a minimal budget, fashioned a cyber punk-post apocalyptic tale of a robot on a killing rampage with enough horror elements and plenty of gore in check to satisfy the casual film observer. For a recap of my review from way back in June of 2011, click here. This is a true beauty, glad we got one that still looks so good, some people really take care of their stuff... I will keep my eyes open for a poster of this..Im not sure if this is difficult to find, will def. keep looking. I've been looking, but have never found one with that image in particular, but you never know. And yes, this is a real beauty of a VHS case. Love it! Thanks man! Nice find, love that film. Same here man! It only seems to get better with age in my opinion. In the spirit of sharing here's a pretty cool Q&A with Richard Stanley about the making of the film. Thanks Jack! Will check this out when I get a chance! 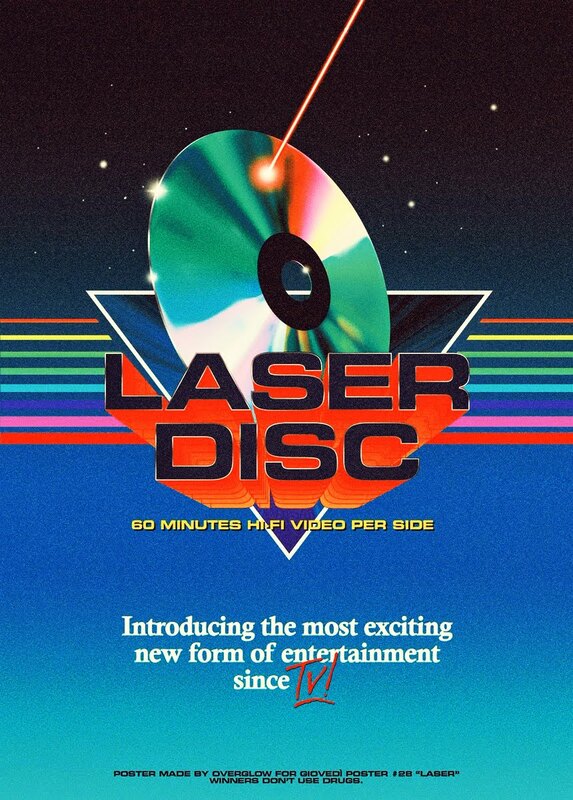 Nothing wrong with getting your hands on some sweet VHS and posting the pics here on your blog. Great stuff.